The Hmong people originated in South China, but many immigrated to Laos, Vietnam, Thailand, and Burma over the centuries due to wars. The majority of Hmong still live in China where they are known as Miao. In 1975 many Hmong in Laos again became refugees in Thailand during the Vietnam War. Some of these refugees immigrated to Canada in 1979, many sponsored by Mennonite churches. In 1980 seven Hmong Christian families began Sunday service at the Grandview Public School in New Hamburg, Ontario. They were assisted by Vin Vanh Vang's sponsor, Steinmann Mennonite Church. Later, the new congregation moved to Wilmot Mennonite Church's fellowship hall in Baden. Both at Grandview School and the Wilmot Mennonite Fellowship Hall, Sunday Services were organized by Tong Hang and the group's Elders. In 1981 So Vang served as the first non-salaried pastor. In 1981 twenty-three Hmong and their sponsors held a meeting to seek financial, leadership and facility support for the new Hmong fellowship. At this meeting Baptist, Christian Reformed, and Mennonite persons offered their church facilities to the Hmong. 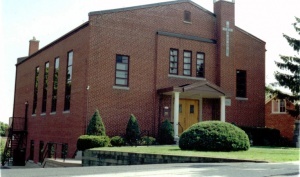 The Hmong group chose First Mennonite Church in Kitchener, and began Sunday services on 1 February 1981. Later Mennonite Central Committee facilitated a Hmong Church Support Committee to assist the new Hmong Church. The congregation then changed its name from Hmong Church to Hmong Christian Church, and in 1985 changed it again to Hmong Christian Church (Mennonite). On 31 December 2000 the name changed again to First Hmong Mennonite Church. When Lao Vang finished his refugee resettlement work at MCC in 1983, Tong Hang was hired as a full time Pastor to assist the congregation as well as refugees who still required help. Tong, who served until 1990, was licensed and his salary was subsidized by the Mennonite Conference of Ontario and Quebec. Ge Yang, a committed lay leader, provided leadership from 1990-1993 together with a strong group of Elders. Under Wang Chou Yang's congregational leadership, the group occupied its own building on 15 November 1996 with financial support from Hmong, the Mennonite Conference of Eastern Canada, the Mennonite Foundation of Canada and various Mennonite congregations. In 2003 the congregation continued to worship in the Hmong language. It was led by a church council and pastor. CMC Nexus (October 1994): 1, 3. Good, E. Reginald. Frontier Community to Urban Congregation: First Mennonite Church, Kitchener 1813-1988. Kitchener: First Mennonite Church, 1988: 149. "Historical Highlights of the Hmong Christian Church (Mennonite)." 1 p. Mennonite Historical Society of Canada collection, Mennonite Archives of Ontario. Mennonite Reporter (16 April 1984): 11; (8 July 1985): 5; (29 October 1990): 17; (21 September 1992): 15; (20 January 1997): 7-8. Vang, Peter. "Leadership Update." Personal e-mail (22 August 2013). Vang, Peter. "First Hmong Mennonite Church (Kitchener, Ontario, Canada)." Global Anabaptist Mennonite Encyclopedia Online. September 2013. Web. 19 Apr 2019. http://gameo.org/index.php?title=First_Hmong_Mennonite_Church_(Kitchener,_Ontario,_Canada)&oldid=148008. Vang, Peter. (September 2013). First Hmong Mennonite Church (Kitchener, Ontario, Canada). Global Anabaptist Mennonite Encyclopedia Online. Retrieved 19 April 2019, from http://gameo.org/index.php?title=First_Hmong_Mennonite_Church_(Kitchener,_Ontario,_Canada)&oldid=148008.